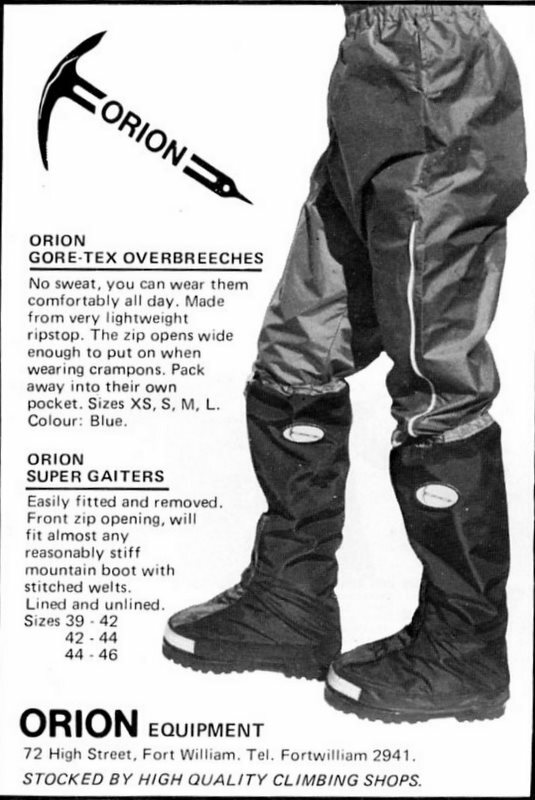 'Orion' gaiters. Black nylon with red zip and velcro front fastening. Drawstring top and bottom. Nylon loop with velcro fastening for tying under boot. White rectangle with a black ellipse. Inside ellipse, a red ice axe with "ORION" along the shaft. 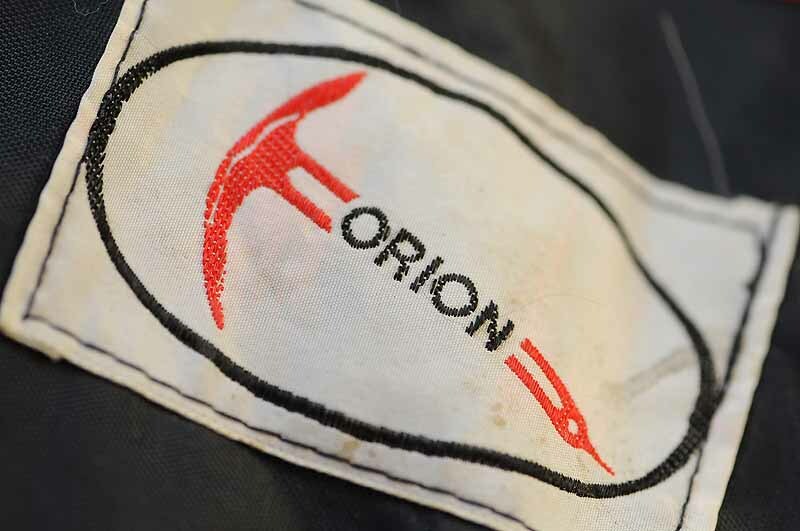 Orion Equipment was part of the Nevisport mountain retail business owned by Ian Sykes and Ian Sutherland from 1969 until they sold it around 2006. They took the name from the Orion face on Ben Nevis which in turn had been named after the constellation of stars, owing to the configuration of climbs on the face. 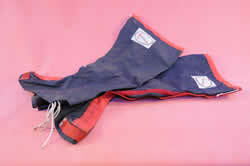 The two Ians were always looking for new ideas and the innovation here was to use strong nylon cord around the bottom of the gaiter that could be tightened into the welt of the boot to hold the gaiter in place.It worked well and it's surprising that it never caught on as Berghaus were experimenting with Yeti gaiters at the time (circa 1982/3) and struggling to get their gaiters to stay on the boots. 40 years on and hardly anyone uses the 'wrap around' type gaiter, mainly due to improvements in boot technology, particularly with regard to waterproofing. Alex Gillespie, who was a director of Nevisport for a while, donated this pair to the collection.